I’ve been immersing myself in the folk music world recently. Not, I hasten to add, because I now live down the road from Woodstock, but for research into my upcoming book about the history of New York music. 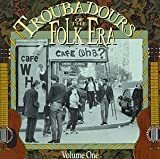 The Greenwich Village folk scene – which had a perceived “heyday” in the early ‘60s but in fact ran from the ‘40s all the way through to ‘70s – will provide a pivotal chapter or two for this book and as I’ve been reading up on it and interviewing some of its key players, I’ve developed a new-found respect for both the music and the musicians. It helps, perhaps, that I have a surprisingly full record collection from the era. Ten years ago – on our first weekend living in Park Slope, Brooklyn – I bought an old couple’s entire record collection at a stoop sale and have been gratified ever since by its depth. This couple followed a very clear musical trajectory through the blues and folk of the late 50s and early 60s, and I inherited well-tended albums by the likes of Lightning Hopkins, Josh White, Mose Alison, Eric Andersen, Janis Ian, Peter Paul and Mary, Ian and Sylvia, Pete Seeger, Joan Baez, Phil Ochs and, but of course, Bob Dylan. Over the last couple of months I’ve had the pleasure of talking with several musicians from this era. I caught a delightfully chatty Janis Ian on her mobile phone in the midst of a new tour, happily reminiscing about the Washington Square hootenannies of her pre-teen childhood. I had Tom Paxton try to beg off an interview with the understandable excuse “God but I’m tired of talking about all that” before coming to the phone clear-headed, charming, witty and possessed of an admirably refined memory. I got John Hammond, who represents the blues end of the Village folk scene, gave him the précis of the book, and sat back as he delivered a perfect summation of the era with barely need for a follow-up question. And I had a friendly conversation with the supposedly crotchety Al Kooper who, before playing in the Blues Project and founding Blood, Sweat and Tears (topics for another chapter), famously played the organ line on ‘Like A Rolling Stone’ and was subsequently part of Dylan’s band boo’d at the Newport Folk Festival, where traditionalist and preservationist Pete Seeger allegedly requested an ax to cut the power. And I got to talk to Pete Seeger himself, whose achievements tower over all these others, Dylan included. Seeger founded The Almanac Singers with Woody Guthrie prior to World War II, put together The Weavers in the years immediately following (their version of Leadbelly’s ‘Goodnight Irene’ topped the charts for several weeks all the way back in 1945), published the magazine Sing Out! in the 1950s, and led folk music’s involvement with the civil rights movement into the 1960s. Along the way he stood up to the Ku Klux Klan, faced down the House Un-American Activities Committee – for which he was charged with contempt, found guilty and only avoided jail time on appeal many years later – and dealt with years of being blacklisted, and somehow emerged from these experiences with his faith in the human spirit completely unbowed. Added to this impressive resume, Seeger has been happily married for a phenomenal 63 years. He and his wife Toshi live in the woods off Beacon, by the Hudson River, from which his ship the Clearwater frequently sails as an exercise in environmental education. For my research, I tracked down his phone number and spoke to Toshi, who assured me her husband was far too busy to talk but suggested I put my request in writing; I was pleasantly surprised to receive my letter back in the mail, with a scribbled note from Seeger alongside a phone number. “Call me,” it said. And I did. Unfortunately, the interview I’d most looked forward to for this chapter of my book was the one that delivered the least. Seeger gave me some background on Greenwich Village itself, but stubbornly refused to be drawn into conversation about the actual music scene or musicians he inspired; he left the City back in 1949, he kept reminding me, as if denying his looming presence in the Village for at least twenty years thereafter. After less than ten minutes, we seemed to have run out of mutual topics. Ah well. At age 86, he’s earned his right to privacy. And in his twilight years, Seeger appears to have given The Boss a much-needed dose of musical adrenalin. Springsteen’s last album of original material, Devils and Dust, offered itself up as a simple folk(‘s) album but was, frankly, dull as dishwater. 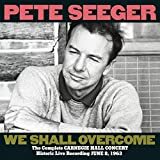 This new album of unoriginal material, We Shall Overcome: The Seeger Sessions, also offers itself as a simple folk(‘s) album and is the most uplifting record he’s made in years. The difference is in the delivery: while Devils and Dust was stripped down to the point of boredom, The Seeger Sessions features an umpteen-person band, complete with washboard, brass section, stand-up bass and fiddles; collectively, they take the songs rapidly beyond the guitar-and- banjo constraints of traditional American folk music, and into the more adventurous sound of the jug band, embracing Cajun, country, skiffle, bar-room and what I can only surmise as whorehouse music in the process. To aid in this process, The Boss is shown on the album’s accompanying DVD encouraging his newest employees to imbibe before singing ‘Pay Me My Money Down’ – “I want a beer-drunk, whisky-drinking sound” he demands, leading by example – and the tipsiness is not out of accord(ion) with the music. Though Seeger himself lives in near isolation, chops woods every day, deals with but one phone line and appears to have no business representation other than his wife, though strait-laced earnestness has often been seen as a requisite for a career in folk music, and though we may look back on the conservative fashions and “proper” presentation of the Weavers, Kingston Trio and Peter Paul and Mary with righteous horror, the folk music of Greenwich Village was far from puritan. In researching that scene, I’ve been reading many other books. From David Hajdu’s fascinating account of the scene’s incestuous (and often self-serving) personal relationships, Positively 4th Street, through Bob Dylan’s recently published Chronicles, the oral history Hoot! and especially in Dave Van Ronk’s incisive and hilarious The Mayor Of MacDougal Street, it becomes clear that the Village of the late 50s and early 60s was one incessant bout of drinking, smoking and shagging. The musicians may have considered themselves diametrically opposed to the world of rock’n’roll, but they were nonetheless living the rock’n’roll lifestyle. Correctly then, Springsteen focuses more on folk music’s sense of rebellion than its sense of righteousness. Be it his generosity with the libations or just his natural sense of leadership, he helps his band turn these old standards into freewheeling celebrations. 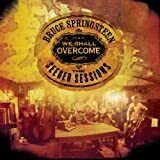 The trio of biographical songs, ‘Old Dan Tucker,’ ‘Jesse James,’ and ‘John Henry’ finds The Boss in more raucous voice than, I might suggest, any time since Born In The USA, while the erstwhile sea shanty ‘Pay Me My Money Down’ comes complete with two key changes and a humorous reference to Mr. Gates as it takes a joyous trip down Bourbon Street. Its enthusiasm is contagious; I’ve taken to playing it in the car on my last four minutes home each night, as a joyous celebration of another day’s work. I had a similar experience the first time I played the CD for Campbell in the car. The moment my rock-phobic son heard the opening song’s reference to ‘Old Dan Tucker,’ he established his own reference to the song. It happened to be from the movie The Little House On The Prairie (which I didn’t even know he’d seen), but at least he’d made a connection.